To prepare the filling, mix the minced meat with the minced onion. Add salt and pepper to taste. To make the dough, begin by melting the butter in a pan. In a bowl, mix the water, salt, flour and melted butter to form a soft dough. Divide the dough into balls. Using a rolling pin, roll out each ball to a thickness of 3 mm (1/8 inch) and cut out rounds 12 cm (5 inches) in diameter. Pat any leftover dough together and repeat the process. 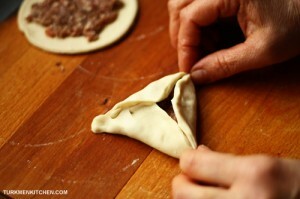 Place a tablespoon of the filling in the middle of each round and spread it out. To fold the pie into a triangle, bring the three sides together and pinch to seal. Place the meat pies on a baking tray lined with baking paper and brush with water. Bake at 250°C (482°F) until golden brown. This is totally worth a try. Somsa is deffinetely one of the best dishes which I love. 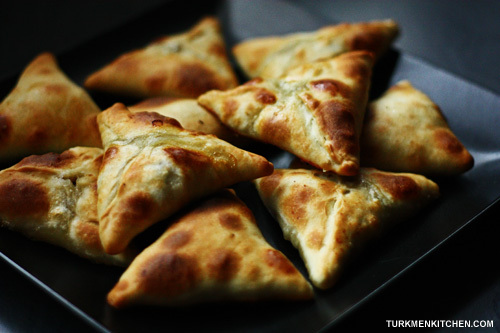 Could you please post the recipe of “Fitji” as well? Glad to hear that 🙂 I’ll post the recipe for fitchi once we have the photos of it.